I LOVE, LOVE, LOVE my Lenni. It's a fabulous machine. I only have one small consistent problem. I can't quilt Right to Left horizontally without shredding my thread. I have absolutely no problem FM quilting in every direction. This only occurs horizontally and Right to Left. I'm using wonderful superior thread. I've tried all different kinds of thread, the problem persists. Now this is no big deal, because I solve the problem by always quilting Left to Right horizontally. I'm just wondering why this occurs. 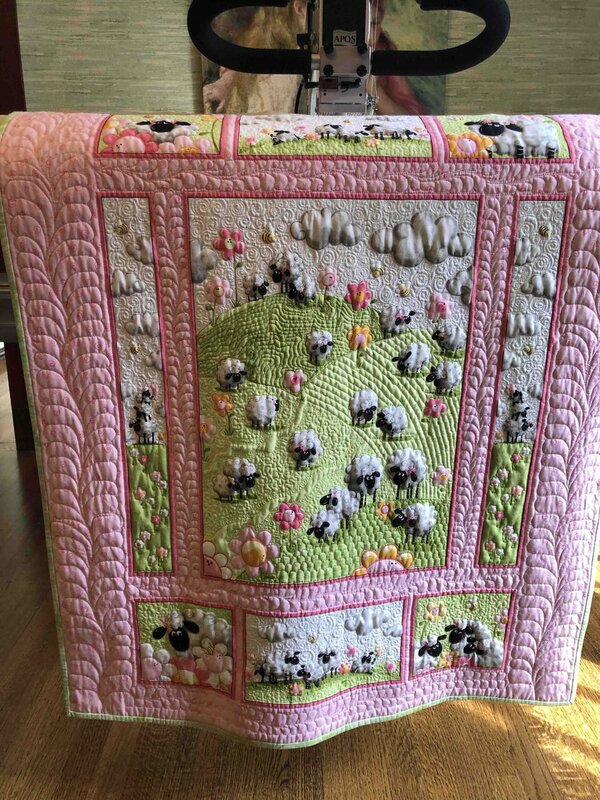 I'm having soooooooooooo much fun making Springtime quilts for the wee ones at the hospital. WOW, that's a fantastic quilt! Sorry I don't have an answer for your thread issue, but I definitely wanted to let you know how much I love your work. Hopefully, someone else on the Forum will be able to help. Sewingpup, I greatly appreciate your comments. So you have the same problem with your Lucey, very interesting. I have tried the 6:30 position, with no effect affect. Really appreciate you taking the time to reply. Happy Left to Right Quilting!!!! Have you checked your thread guides and needle plate for burrs or worn spots? Just flip the thread guides around, so that the thread is not constantly running in the same spot. If the needle plate has any nicks, just buff smooth with an emery cloth. Olympia: Exactly which Superior thread are you using? They make a lot, and some work on a long arms better than others. Your machine will never sew as well from right to left as it will from left to right. Same thing front to back. It's because of the rotary bobbin system our machines use. That lockstitch system was intended for back to front sewing with feed dogs. This makes timing and all hook adjustments critical for these machines. Thank you!!! Thank you!!! Will do everything you've both suggested! Thank you, Allison. I have learned your APQS rep is right! Thanks for taking the time to share the information.